Divas, it's Meatless Monday time again! Today, I'm bringing you a salad inspired by a dish I had at Cube, one of my favorite Los Angeles restaurants. The salad is made from Blue Lake green beans, Romano beans, sweet corn, and toasted Macadamia nuts. I got the nuts from Oh! Nuts, a fabulous wholesaler of nuts and dried fruit. They were huge and rich, just how you want Macadamia nuts to be. I toasted them, reserving half of them to make into a paste to whisk into the dressing, and chopping the other half to toss into the salad. This dish turned out so fabulous! It's healthy, full of fresh summer produce, and healthy fats, and protein from the nuts. Macadamia nuts "contain 78% monounsaturated fats, the highest of any oil including olive oil," and no cholesterol, making them a great choice for your heart. I finished the salad with some shaved parmesan reggiano cheese. This dish is a true winner! Place half of the toasted Macadamia nuts in a small food processor and grind into a paste. Add the vinegar and olive oil and blend together. Season to taste with salt and pepper. To make the salad, chop the remaining macadamia nuts into halves or quarters. Place the Macadamia nuts, Romano beans, green beans, and corn in a bowl. Add the dressing and toss to combine. Check seasoning (salt and pepper). To plate, scoop some of the salad into a bowl. Top with shaved parmesan. Enjoy! Divas, there's been a lot happening in the world of Domestic Divas! Hopefully you caught my new column, "Don't Rush the Risotto," published in the Hawaii Women's Journal and my recipe for "Rustic Peach Pie with Whole Grain Spelt Crust" published by KCRW's Good Food Pie-A-Day blog. I'm also starting to post Sous Vide recipes using my Sous Vide Supreme (check out this one for Sous Vide Pork Tenderloin with Sherry-Shallot Vinaigrette). And tonight, I'm hitting up Breadbar on W. 3rd St. in Los Angeles for their "SobaPop" Artisanal Noodle Pop-Up Bar. It's this week only. In the meantime, here's a great, light summer recipe for Grilled Shrimp with Spinach, Cucumber, and Yogurt Salad. It's healthy and refreshing, perfect for lunch or a lovely dinner. So check it out! Skewer the shrimp, brush with olive oil and sprinkle with salt and pepper. Once the grill is hot, quickly cook the shrimp, turning once (about 4 minutes). Remove from heat and allow to cool. Remove the skewers from the shrimp and set aside. Meanwhile, to make the dressing, whisk together the lemon juice, dill, and garlic. Slowly, whisk in the yogurt. Season with salt and pepper. Taste and adjust seasoning if needed by adding more lemon juice. To plate, toss the spinach and cucumber with the salad dressing. Place in a serving bowl and top with the grilled shrimp. Squeeze a little fresh lemon juice on top if desired. Enjoy! Time Magazine Article on Meatless Monday! Divas, check out this great "Time" magazine article on Meatless Monday! And read my blog every Monday for great Meatless Monday recipes. Meatless Monday: Sweet Corn "Succotash"
Divas, here's a great little dish I made for a potluck dinner at a friend's house. It's a Sweet Corn "Succotash" made with corn, red bell peppers, red onion, and finished with fresh cilantro. I wanted to create a dish that made the most of the amazing corn available at the farmers markets and grocery stores right now. While a traditional succotash has lima beans or shell beans, I wanted to make a lighter dish that really showcased the corn, but feel free to add beans if you desire. Add the onion and saute until beginning to soften (about 5 minutes). Add the garlic and saute for one more minute. Then, add the bell peppers and the corn and saute until beginning to soften (about 5 minutes). Fold in the cilantro and season to taste with salt and pepper. Enjoy! Check Out My Recipe for "Rustic Peach Pie with Whole Grain Spelt Crust" Published on the Good Food Pie-A-Day Blog! My recipe for "Rustic Peach Pie with Whole Grain Spelt Crust" was just published on the Good Food Pie-A-Day blog. I created this "healthier" take on the pie just for them. If you're not familiar with "Good Food" on KCRW public radio, it's an amazing food show hosted by Even Kleiman. It's a huge honor to be published on their site. I can't wait for the upcoming pie contest, which Evan Kleiman hosts every year. Here is my first post about my new Sous Vide Supreme. Let me begin by saying that I've only used it six times so far (in two weeks), but already it's life changing. Sous-vide, French for "under vacuum," involves vacuum sealing food into plastic bags and cooking them at low temperatures for extended periods of time in a temperature controlled water bath. In concept, this method of cooking maintains the integrity of the ingredients due to the low temperatures. A technique frequently used in fine dining settings (my Top Chef Brother does a ton of it, and is my chief culinary consultant in all things sous vide), it's only recently become affordable to the home chef thanks to the Sous Vide Supreme. Lean meats (pork tenderloin, beef tenderloin) are the most clearly appropriate for sous vide cooking. Not only does it render them exceptionally tender and keep them moist, but it brings them to a perfect medium rare throughout. With sous vide, there is no risk of overcooking. Cooking sous vide depends on two things—temperature and time. To assist in learning this technique, I relied on blog posts, the cookbook "Sous Vide for the Home Cook," the temperature charts that came with the Sous Vide Supreme, and my Top Chef Brother's advice. The ubiquitous tomb, "Under Pressure" by Thomas Keller, is on its way (though I've heard it was written for professionals, but we'll see). More on this once I receive the book. For my very first sous vide experiment, I decided to cook pork tenderloin and settled on a decadent technique. I decided to cook the pork with rendered bacon fat. Yup, you heard me right. I served the pork tenderloin over a bed of pearl barley and topped with a sherry-shallot vinaigrette, wanting to taste the meat. I was not disappointed! The pork was by far the best and most tender I've ever made. It literally dissolved in my mouth in a pool of bacon-flavored meat. This recipe was a winner. Next week, following my Top Chef Brother's advice—I'll be trying another preparation of pork tenderloin that involves an apple cider brine, a sear, and then sous vide cooking the meat with bacon slices for flavor. I can't wait! 1. Preheat the Sous Vide Supreme to 135 to 140 degrees (depending on how well you want it cooked). 2. Meanwhile, rub the pork tenderloin with the garlic and season with salt and pepper. Place in a plastic bag with the rendered bacon fat. Vacuum seal the bag. Place in the Sous Vide Supreme and cook for at least 2 hours (but you may cook it for longer). 3. To make the vinaigrette, whisk together the olive oil and vinegar and season to taste with salt and pepper. 4. Once the pork has finished cooking in the Sous Vide Supreme, remove from the water bath. Heat the grapeseed oil over medium high heat in a saute pan. Cut open the bag and remove the pork. Quickly sear it on all sides and set aside. Allow it to rest for five minutes before cutting the tenderloin into half inch slices. 5. To plate, layer slices of pork on a plate and drizzle with the sherry-shallot vinaigrette. Enjoy! Special Edition Meatless Monday: New Column in the Hawaii Women's Journal Featuring My Recipe for Vegetable Risotto! For this special edition of Meatless Monday, hop on over to the Hawaii Women's Journal and read my new column, "Don't Rush the Risotto," and recipe for, "Vegetable Risotto with Asparagus, Savoy Spinach, and Fresh Goat Cheese." Risotto is one of my favorite dishes to make "meatless." The recipe also includes two different ways to make homemade veggie stock. And while you're at it, peruse the rest of the issue. It's packed with great articles, recipes, and advice. Enjoy! Click here to link to the Hawaii Women's Journal! 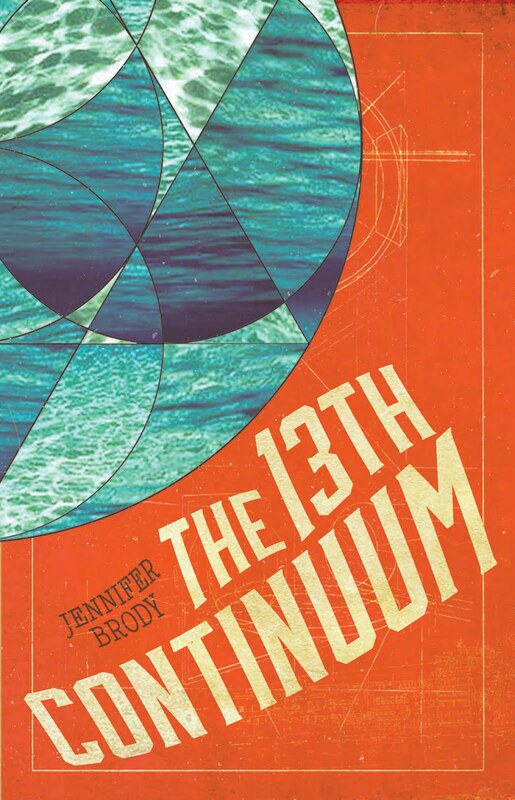 You can read it online or download the pdf. There's been a big development in my kitchen. For my birthday, Kuzak gifted me with a Sous Vide Supreme and a vacuum sealer. This new toy is going to take my cooking to a whole new level. Stay tuned in the coming weeks as I begin integrating sous vide cooking into my repertoire. I've made pork tenderloin, rib eye steak, sweet corn and baby carrots so far, and the results are impressive. I'll post pictures and recipes soon. In the meantime, here's a recipe that uses my other favorite piece of equipment - my grill. This is a recipe for lamb kebobs using grass fed lamb (I get it from my CSA). Grass fed meat is better for you than grain fed meat because it contains omega-3's, that awesome stuff that's also in wild caught fish and is essential to health. I also happen to think it tastes better - less fatty, more tender. I love making kebobs, too. It's such a great way to get your meat and veggies all in well quick dish. I collect great veggies from my farmers market like cherry tomatoes, summer squash, red onions, and bell peppers. Then, I serve the kebobs over long grain brown rice (new studies show that eating brown rice can lower you risk for diabetes). I finish them off with a quick lemon tahini sauce and come fresh chopped mint, both of which pair great with the lamb. To make the marinade, whisk together the ingredients in a nonreactive bowl. Add the lamb and allow to marinade for at least 30 minutes and up to four hours (in the refrigerator). To make the lemon-tahini sauce, whisk together the tahini, lemon juice and cumin in a bowl. Add water as needed to thin to a nice consistency. Season to taste with salt and pepper and set aside. Assemble the kabobs by spearing the lamb, tomatoes, peppers, squash, and red onion in an alternating pattern. Once all the kabobs have been assembled, season them with salt and pepper and brush them with the olive oil. Cook the kabobs over the grill, turning once. Remove from heat once the meat is cooked through and the vegetables are tender (about 3-5 minutes per side for medium to medium rare). To plate, place two kabobs on a plate. Drizzle with the lemon tahini sauce and sprinkle with the fresh chopped mint. Enjoy! Great NPR Story on Meatless Monday! Divas, you must check out this great NPR article on Meatless Monday. As you know, I'm a big supporter. I publish Meatless Monday recipes once a week (on Monday of course!). 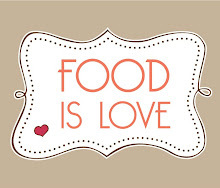 So check out this article and read my blog for great meatless recipe ideas. Click here for the NPR article on Meatless Monday! Under Pressure: The Joys Of Pressure Cooking! 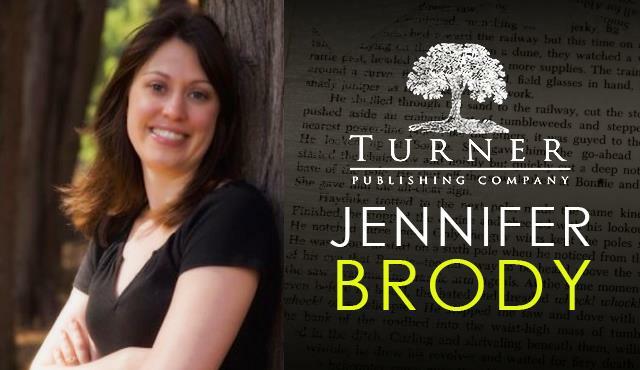 Guest Post from the Original Diva! The Original Diva a/k/a my mother has written a wonderful guest post about why she loves pressure cooking, a technique that has long been in her kitchen repertoire. Not only can pressure cooking save you time and money, but it preserves food's vitamin and mineral content. 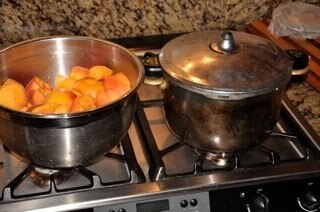 In this post, she explains how she used her pressure cooker to can local peaches to preserve them for the winter. Now that's thinking ahead! Now that the summertime is upon us and we have a bounty of wonderful organic fruits arriving, I decided to use my Durotherm Pressure Cooker to store up for the winter months ahead. These pots come from a Swiss company and I have used them for over 30 years now. They make sense for several reasons; the flavor, vitamins and color are sealed in by a unique flavor seal that keeps oxygen out and moisture in and are heat-efficient using 60% less cooking energy. This is good for you, as well as the planet! Kuhn Rikon, the parent company that manufactures the Durotherm Pressure cookers has done studies on the amount of time-savings that translates into real savings in energy. How would you like to cook a risotto in in 7 minutes? On their website, they break down the real savings for you by looking at different recipes and calculating the energy savings. For instance, a roast pork or pot roast would take about l hour and 30 minutes in the electric oven (including preheating) verses cooking the roast in a pressure cooker on a gas stove. You would save .82 cents every time you cooked the roast. This may not seem like much, but remember the time as well as the energy expelled. By their calculations, a family could save $325.00 a year using pressure cooking. At that rate, you would pay for a pressure cooker in 6 months! Probating over a 20 year life of a pressure cooker, that savings comes to $6500.00. 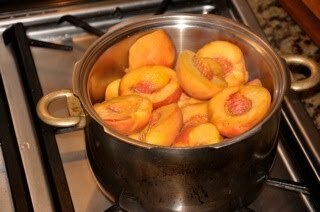 So, rather than spend my time canning a bounty of Floyd peaches, I decided to use my pressure cooker to cook the peaches for the freezing. I cut my time down dramatically by just halving the peaches, removing the pit and not taking the skin off until after I removed them from the cooker. By doing this, the skins just rolled off the fruit. 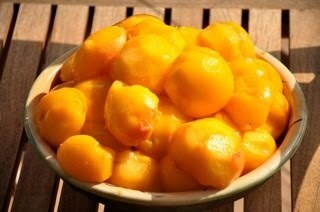 I cooked the peaches for 30 seconds to a minute, depending on the size of the fruit. 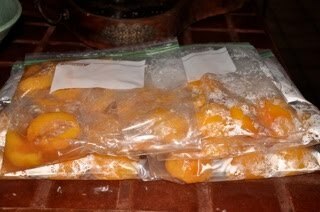 Within an hour I had prepared, cooked and stored the fruit in freezer bags ready to be frozen. Now I saved money and time, stored fruit for the cold winter months when we don't have fresh local fruit available and with the time I saved, I have more time to play! If you're a Domestic Diva like me, then this is reason to rejoice. Many of us were raised on tasteless, picked when they were green and ripened artificially in transit, grocery store tomatoes. A culinary travesty, if you ask me. Tomatoes are one of my top five desert island foods, however, I don't eat them out of season. Instead, I go on a self-imposed tomato fast, waiting for the moment, in the peak of summer, when the heirloom tomatoes roll into my farmers market like chubby, cherubic invaders. Fortunately, I don't have to wait any longer because the heirloom tomatoes are here. These tomatoes come in a variety of colors, shapes, and sizes, from purple, to yellow, to green and everything in between. For this reason, they weren't chosen for large scale agriculture, but instead have been raised by smaller farmers. At the Hollywood Farmers Market on Sunday, I was thrilled to discover that my favorite heirloom tomato vendor was selling imperfect heirloom tomatoes (sunburned, or slightly damaged) for one dollar a pound. Let me repeat that. One dollar a pound. That's an incredible bargain. I scooped up a pound of these castoff beauties and whisked them home, prepared to turn them into gazpacho, a chilled soup made out of fresh vegetables. I pureed the tomatoes with cucumber, bell pepper, jalapeno and red onion, adding some balsamic vinegar, olive oil and salt. Then, I served this lovely, golden yellow soup with a drizzle of lemon olive oil and a crumbling of fresh goat feta. The heirloom tomatoes really added a level of sweetness and freshness to this gazpacho. It tasted so purely of summer - bold, fresh, ripe, sweet - that I'll be making it every week until the end of tomato season. Gazpacho is great served for lunch with toasted garlic bread or as an appetizer at dinner. Place the tomatoes, cucumbers, peppers, jalapeno, red onion and garli in a blender and puree together until combined but still a little chunky. Add the balsamic vinegar and the olive oil and mix together. Season to taste with salt and pepper. Chill the soup for at least an hour in the refrigerator (may be made a day in advance and kept in the fridge). To serve, ladle the soup into bowls. Crumble some feta cheese on top and drizzle with the lemon olive oil. Top with a little fresh cracked pepper. Enjoy! That's right, summer continues to rock and roll across the country. While record temperatures have been assaulting much of the east coast, so far we've had a mild summer in California (knock on wood!). I made this little gem of a recipe the other week. First, I skewered and grilled shrimp and corn tortillas. Then, I layered the shrimp in the tortillas over shredded cabbage and topped with with a Peach-Jalapeno Salsa. The twist? I added a little plain Greek yogurt to the salsa for a refreshing, cooling effect. This was an easy to make, tasty dish perfect for any hot summer night! To make the salsa (while the grill is heating), toss all the ingredients in a bowl and season to taste with salt and pepper. Set aside. If making the salsa in advance, keep it chilled in the refrigerator. Skewer the shrimp, brush with olive oil and sprinkle with salt and pepper. Once the grill is hot, quickly cook the shrimp, turning once (about 4 minutes). Remove from heat and allow to cool. Meanwhile, heat the tortillas on the grill. Chop the shrimp into bit-sized pieces (removing the tails). To assemble the tacos, layer some cabbage and top with pieces of shrimp. Spoon the salsa over the top. Enjoy! New Issue of the Hawaii Women's Journal Coming Soon! New issue of the Hawaii Women's Journal = New Domestic Diva Column! This time it's "Don't Rush the Risotto." I love making risotto so much that sometimes I think I should change my name to Risotto Diva. Lately, I've been on a veggie risotto kick. I love hitting up the farmers market for the best local produce and then transforming it into a creamy (without any cream), sumptuous rice dish made with homemade vegetable stock. I find that risotto really showcases its ingredients, making it an ideal vessel for foodie deliciousness. In fact, my upcoming "Domestic Diva" column for the Hawaii Women's Journal is all about risotto (stay tuned for the publication). Last week, at Kuzak's urging, I hit up LA's FungHi booth at the Hollywood Farmers Market for some morel mushrooms. The tables were loaded up with baby shitakes, chanterelles, and oyster mushroom, but I couldn't let myself be distracted by the treasure chest of funghi. I was on a morel mission. These mushrooms are prized by French cooks and contain a small amount of toxins that are removed by cooking (they should never be consumed raw). I scooped up a prized $10 paper bag of morels, ogling their honeycomb shape, and brought them home. After some contemplation, I decided to make a morel mushroom risotto. My goal was to showcase as much morel flavor as possible. First, I made a quick vegetable risotto by simmering onions, carrots, celery, peppercorns and the morel mushroom stems in filtered water for an hour. I love using homemade vegetable stocks when making risotto. I find that it gives the dish a delicate, subtle flavor that doesn't overshadow the ingredients. Next, I made a very basic risotto with the mushrooms. I finished the dish with grated Parmesan Reggiano, extra virgin olive oil and fresh cracked pepper. Kuzak and I settled down at the table to feast, the Adorable Monster curled up in a ball at our feet, and dug into the dish. The delicate, creamy risotto let the morel mushrooms shine. We savored their flavor down to the very last bite. Note: this risotto recipe would work for any type of mushrooms. Add the vegetable stock to a sauce pan and warm over medium low heat. Heat the olive oil in a heavy bottomed pan over medium heat. Add the shallots and saute until translucent, about 4 minutes. Next, add the mushrooms and saute until they soften and their juices release. Add the rice and stir to combine. Cook for another one to two minutes. Pour in the white wine and cook until absorbed, stirring occasionally. Once the wine has been absorbed, add the vegetable stock 1/2 a cup at a time, stirring until absorbed before adding more stock. Continue cooking the rice in the stock until it's cooked al dente (you may not use all of the stock). When the rice is cooked, finish the risotto by stirring in the parmesan and a little more olive oil. Season to taste with salt and pepper. Enjoy!